Winter poses different challenges for my skin. It has to be able to combat the cold, harsh Texas wind as well as the warm, dry indoor air. Both types of environments can be drying, even if your skin is combination oily. All skin types need moisture. Enter the winter skincare routine. Five months ago I looked at my myself in the mirror, and I mean really analyzed my skin, with a discerning eye. I had dry patches, ruddy, uneven tone and color. Some areas were exceptionally oily. I had also started to develop dark circles and fine lines beneath my eyes. Not only did my makeup-less skin look in poor shape, but even with makeup, there was no amount that could correct what was wrong underneath. That’s when I decided I needed to introduce a skin care routine back into my life. In the morning, my face usually isn’t that dirty. I tend to use a slightly more emollient moisturizer at night, especially during the winter months, to give it more time to absorb, but other than that my morning routine isn’t about heavy makeup removal. It’s just about light cleansing. To start I use Clarins Gentle Foaming Cleanser with Tamarind and Purifying Micro Pearls. I’ve been using this cleanser for about 3 months now and to be honest, it’s better for the summer months. It really cleans to the point where my skin feels tight and squeaky. But it’s what I have so I’m going to use it until it runs out! The thick consistency of Clarins Gentle Foaming Cleanser with Tamarind and Purifying Micro Pearls makes it easy to work into a thick, creamy lather. The consistency is like very thick, whipped cream. It works up into a nice foamy lather. It says there are “purifying micro pearls” but to be honest, these so called pearls could just as well not be in there and you wouldn’t miss a thing. This is also where my Clarisonic Mia 2 comes into play. And I really only use it once a day, primarily in the mornings. Once I’m finished washing my face with the Clarins Gentle Foaming Cleanser and Clarisonic, I pat my skin dry. 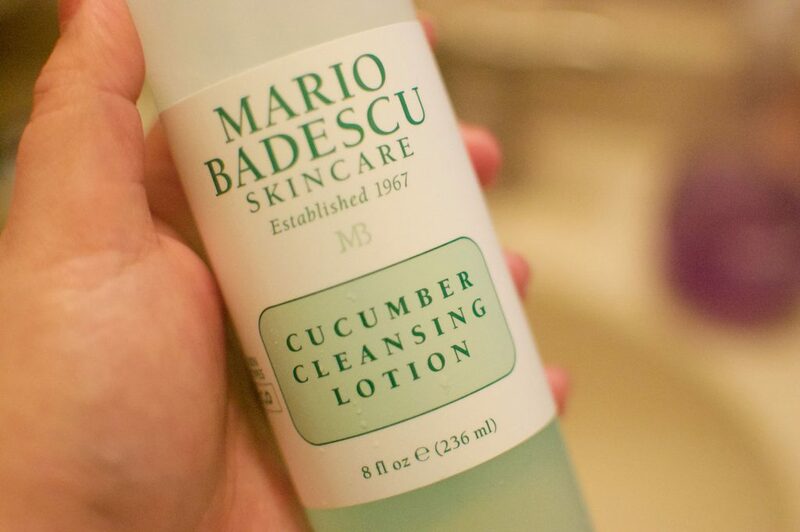 Using a cotton pad, I lightly apply Mario Badescu’s Cucumber Cleansing Lotion. I’d actually recommend this toner for oily/combination skin during the summer months. The alcohol in this cleansing lotion tends to be a little drying, hence the reason why I tend to over-moisturize. Because it contains alcohol and can be drying, I don’t rub it in too harshly, except in the crevices around my nostrils. Anywhere your skin folds into itself is an area that’s likely to gather a lot of dead skin cells and gunk so I like to give those areas a good cleaning. This is another product I probably wouldn’t use for a winter skincare routine, but because I don’t want it to go to waste, I’d rather use it. This serum is totally worth it. It does what it says and offers ultra hydrating moisture in a lightweight gel. Next I apply First Aid Beauty’s Ultra Hydrating Serum. Around $40 for a small bottle, this is the most expensive serum I own (though it probably won’t be my last). This clear, lightweight gel fulfills its promises and delivers an ultra hydrating layer of moisture to your skin without weighing it down. This is particularly why I like using this under my makeup. This is a simple hydrating eye cream that I picked up from Target. It absorbs quickly and has a pleasant, fruity scent. After my serum, I’ll apply a simple hydrating eye cream. Right now I’m trying the Boots Botanics Hydrating Eye Cream. I picked this up on clearance at Target so it was a steal. It’s a lightweight cream that has a pleasant fruity smell and absorbs quickly under the eyes. I also started using this upper eyelid product twice a day called Clinical Strength Upper Eyelid Lifter from Bremenn Clinical. This particular eye cream is supposed to be used for the upper eyelid to target its specific issues (mine being excessive wrinkleyness!) I’ll often apply this one after the other eye cream since it’s a heavily concentrated formula. It’s not my favorite eye product because honestly it has this awful smell, but at least you don’t have to apply a lot. The last step in my morning routine is a moisturizer. Yes I did apply a moisturizing serum but this is on top of that! Remember it’s still pretty chilly around here and when your skin is well-moisturized it’s not likely to produce excess sebum and appear really shiny. Lately I’ve been using a moisturizing balm from Lush called Magical Moringa. Lush’s magical tub of Magical Moringa. On cold mornings, this thing is solid as a rock. I usually have to rub my fingertips into the product until it melts enough for me to be able to apply it to my face. This moisturizer is unlike any moisturizer I’ve tried before, except for maybe Benefit’s Dr. Feelgood, but even that isn’t categorized as a moisturizer. And Dr. Feelgood leaves a matte finish at first, but then over time my face turns into an oil slick. With Magical Moringa, it’s the opposite. The product starts out as a buttery balm that melts into an oil on contact, then it seems to quickly absorb into my skin leaving a soft matte finish. I’ve been really impressed with it so much that I use it both morning and at night.